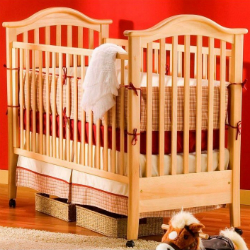 OTTAWA -- Health Canada is advising parents and caregivers that cribs more than 10 years old should not be used because they are more likely to have broken, worn, loose or missing parts, or to be missing warnings or instructions. Health Canada previously instructed consumers not to use cribs manufactured before 1986, said spokeswoman Christelle Legault. In 1986, Health Canada made significant changes to the Cribs, Cradles and Bassinets Regulations. Cribs made before 1986 are not safe and should not be used. It is illegal to sell or give away cribs that do not meet the current safety regulations, Legault wrote in an email. Health Canada has developed a series of publications aimed at educating parents, caregivers and the public regarding the safe use of consumer products intended for children. The first booklet in the series is "Is Your Child Safe? ", which focuses on safe sleep practices and other household dangers. “Publications for ‘Play Time’ and ‘Bath Time’ are expected to be made available to Canadians in the coming months,” Legault said. Health Canada says it has received reports of injuries and/or deaths related to the improper use of many products mentioned in the guide. Health Canada advises parents and caregivers to check regularly for recalls of children’s toys, clothing, furniture and equipment by contacting the manufacturer or by visiting Health Canada's Consumer Product Recalls web page.